The Related Items Watchlist shows any Indexes and Exchange Traded Funds the current symbol is a part of. You also have immediate access to lists of all the stocks that share the same Sector or Industry category. If the current symbol is an Index or an ETF, you’ll find a list of its components or holdings. 1. Click the Watchlist button. 2. Select any of the Related Items that are highlighted in blue. 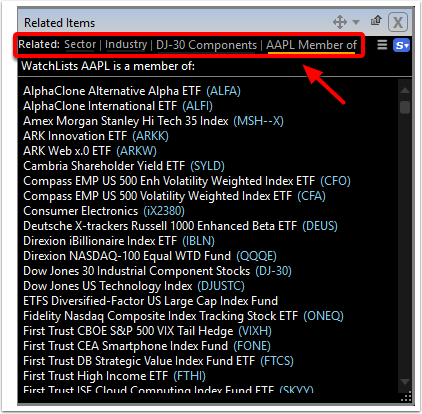 The components list will always display the last symbol you were on that had component holdings, this can be an Index or ETF. 3. You can toggle between the different Related Items Watchlists by clicking on the tabs. Both the DrillDown and Sector by Year prebuilt layouts make use of the related items watchlists.